WildeHerb is a collection of wild herb and wildflower sightings. Last week the yellow-necked caterpillar made a return! We hadn’t seen these voracious caterpillars for a couple of years then outta nowhere they’re seen huddled together on an almost naked blueberry branch. Take note of the thin yellow segment just behind the black head. That’s how it got its name, Yellownecked Caterpillar. If I just let them go on eating, I wonder how much of a single blueberry bush they could eat? 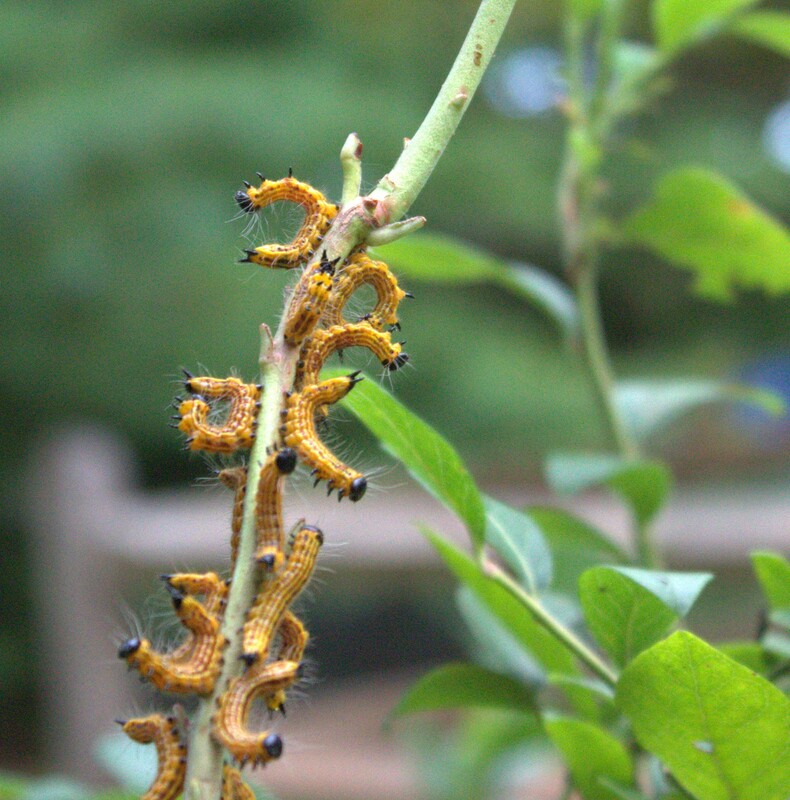 Funny, when I noticed them these black and yellow caterpillars were huddled in a group on a bare stem. Do they eat at night? Or were they just finishing their meal when I happened upon them? This morning I see another bare stem on a blueberry bush so I’ll have to go out with some clippers to prevent more damage. One cool thing about the yellownecked caterpillar, Datana ministra, is its habit of curling both ends of its body when threatened. It’s a defensive posture that they make, but I’m wondering what other caterpillars do this? 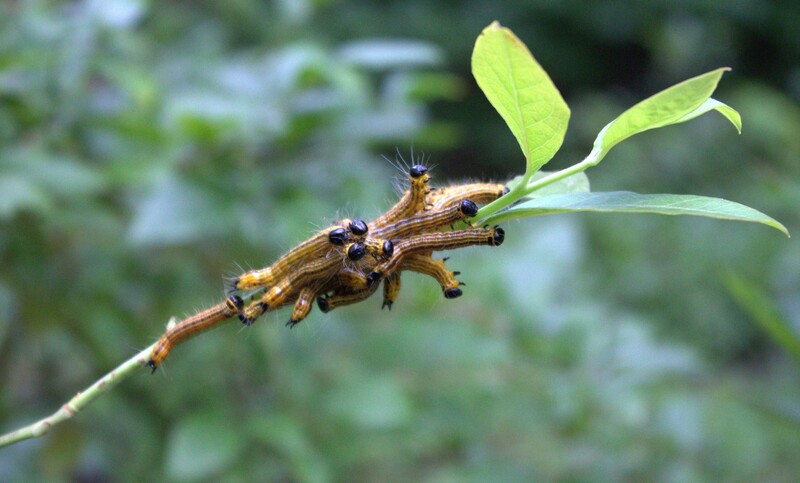 If you see these caterpillars on your ornamental trees, shade trees or fruit trees, shake the branch they’re on and they’ll show you who’s the biggest! What kind of butterfly makes the yellow-necked caterpillar? According to Penn State Extension Specialist, Gregory Hoover, the adult form of this caterpillar is a cinnamon brown moth that appears during June and July. The females lay their little white eggs in masses on the undersides of leaves. Removing any leaves that contain egg masses would surely be a way to keep more of the leaves on the bushes. By the time we see the caterpillars they’re probably mature larvae who are getting ready to pupate. They are supposed to be about 50 mm in length at maturity and I’d guess they were all of that, about 2 inches long. The yellow-necked species will make their way to the ground where they burrow in a few inches and transform themselves into pupae. They overwinter in the protected state of pupa and emerge as adults the following summer. So, knowing this – and yes, knowledge is power! – I may have made a mistake in the way that I disposed of the critters I removed from the blueberry bushes. Last time that the Yellow Striped Caterpillars ate all the blueberry leaves, I made sure to remove them permanently by dunking the whole herd into a bucket of soapy water. This time I unknowingly clipped off the bare stems with said groupings of caterpillars and put them in a compost pile. I thought maybe they’ll just die and another critter of the compost would appreciate the meal. Now I know that I probably just planted next year’s new generation of blueberry-loving pest!